The fisheye camera lens was originally developed so that the whole sky could be captured in one single image to help meteorologists study cloud formations. However, the extravagant 180-degree angle of view soon found favour with photographers. One thing that sets fisheye lenses apart from regular ultra-wide lenses is their curvilinear rather than rectilinear optics. This means that rather than aiming to keep straight lines straight, they exhibit extreme barrel distortion, bowing parallel lines – which you can use to creative effect. 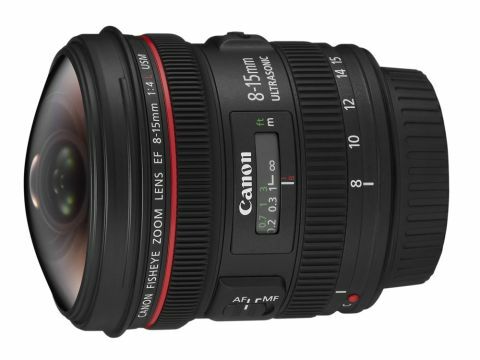 But what is it that makes the new Canon EF 8-15mm f/4L Fisheye USM so special? Conventionally, you have to choose between two types of fisheye lens. A circular fisheye produces a circular image that only covers the central portion of the sensor, leaving the remainder of the frame black. The other option is a diagonal fisheye, which produces a larger image that covers the whole sensor, resulting in a more typical, full-sized rectangular picture. The unique thing about the Canon 8-15mm fisheye is that it produces a circular fisheye image at 8mm, stretching to a diagonal fisheye image at 15mm. Essentially, you get two lenses in one. There's a catch, though – the EF 8-15mm is designed for full-frame cameras like the Canon EOS 5D Mark II, and you don't get the dual circular and diagonal fisheye options on cameras with smaller sensors. With Canon's APS-C cameras, such as the EOS 50D and 550D, you get full sensor coverage at 10-15mm focal lengths, and on APS-H cameras such as the EOS-1D Mark IV, which have slightly larger but not full-frame sensors, it's 12-15mm. At 8mm focal lengths on APS-C D-SLRs, you'll merely get extreme vignetting (cropping of the corners) instead of a circular image. To help avoid this, there are C and H markings next to the zoom ring, as well as a zoom limit switch for APS-C cameras, locking the zoom range at 10-15mm. Another disappointment is that, at the 15mm end on APS-C cameras, the bowed fisheye distortion effect is rather minimised. As an L-series (Luxury) lens, the EF 8-15mm boasts fully professional, robust build quality. Features include a constant f/4 maximum aperture that's available throughout the zoom range, environmental seals to guard against moisture and dust and fluorine coatings on the front and rear elements to enable easy cleaning. That's a bonus, because the protruding, dome-shaped front element is very exposed to the weather. Plus, the supplied lens hood can only be used at 15mm, otherwise it cuts into the corners of the image. Ring-type USM (Ultrasonic motor) autofocus is super-fast and practically silent, complete with full-time manual override. Measuring 78.5x83mm and weighing 540g, it's rather larger and heavier than Canon's now obsolete EF 15mm f/2.8 fisheye prime lens, but still smaller and lighter than the regular EF 16-35mm f/2.8L ultra-wide full-frame lens. In our tests, sharpness proved very impressive, especially between f/5.6 and f/11. The lens is also remarkably resistant to ghosting and flare, helped by the use of Canon's Subwavelength structure coating (SWC). That's good news, because you often capture a vast expanse of bright sky when using a fisheye lens outdoors. As with other circular fisheye lenses, we often got a blue edge around the circumference of the image in circular fisheye mode, but it's quite easy to apply a circular crop in Photoshop to fix this. Colour fringing around high-contrast edges was also quite noticeable, but you can shoot in RAW and tune these out in the Digital Photo Professional software supplied with your Canon camera. On a full-frame camera such as the EOS Canon 5D Mark II, the EF 8-15mm Fisheye is a wonderfully versatile lens that enables you to switch between circular and diagonal fisheye effects with a twist of the zoom ring. Image quality is very good in terms of sharpness, contrast and resistance to ghosting and flare, although colour fringing can be quite noticeable. For APS-C cameras, the lens is relatively poor value. Image quality is retained but versatility is lost. It merely becomes a diagonal fisheye lens with reduced zoom range, and the heavily distorted fisheye effect is largely lost at the long end of the zoom range on an APS-C camera. Ultimately, if you're shooting with a camera such as the Canon EOS 1100D, Canon EOS 600D, Canon EOS 60D or Canon EOS 7D, you're better off with either the Sigma 4.5mm f/2.8 EX DC HSM circular fisheye or the Sigma 10mm f/2.8 EX DC HSM diagonal fisheye, both of which are designed specifically for APS-C cameras and only cost about half the price.